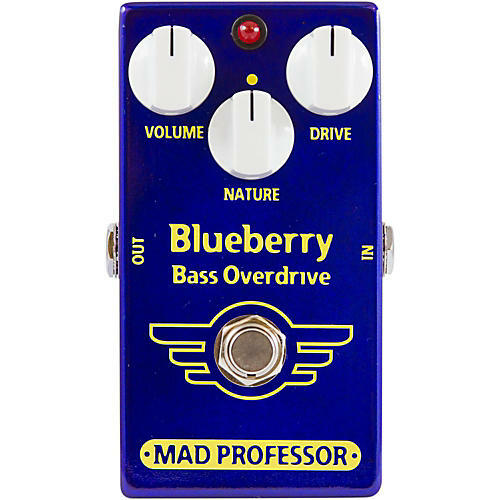 The Mad Professor BlueBerry Bass Overdrive is a high quality dynamic overdrive pedal for electric bass. It was designed for light to medium overdrive, reminiscent of vintage tube bass amplifiers. With the Drive control, you can get natural dynamically controlled overdrive like on those old tube bass amplifiers, or more compressed thick distortion. At lower drive settings the BlueBerry Bass OD distorts more the harder you strike the strings. There is no definite clipping point, but rather different shades of distortion as the amplitude changes. Higher settings will give more compressed sounds. With the clever Nature adjustment one can adjust the tone, and control what register distorts whether it's really big and fat with low register distortion to cutting upper midrage solo bass tone. While mainly designed for bass guitar, the BlueBerry Bass OD can also be used with other instruments for low, dynamically controlled distortion and can even be used as a booster. Drive: Sets the amount of distortion and sustain, as well as the type of distortion. Lower settings give dynamically controlled overdrive. Higher settings will give more compressed sounds. Nature: A tone control for filtering and to control what register distorts. Turning CCW gives more lowend and also distortion in the lower registers.